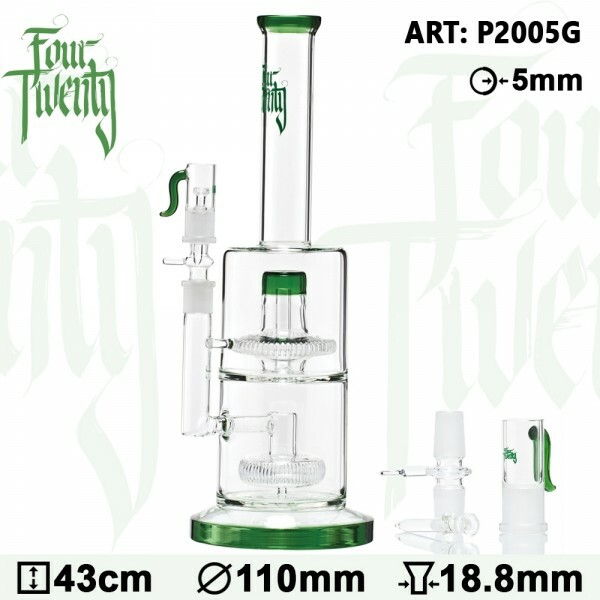 This FourTwenty Scientific Bong is a marvelous piece of glass artwork that will offer you an amazing hit! It comes with some green accents upon a sturdy heat proof borosilicate glass formed in the shape of a flat base tube. You can place your herbs onto the bowl coming with a handle for easily lifting it up and cleaning it at your convenience. The bowl connects to a built-in chillum through a sure ground of 18.8mm. The smoke passes inside the tube through a shower diffuser that will break up your smoke. A percolator disk will extra filter your smoke. With the FourTwenty logo featuring at the top of the tube, the whole set-up ends up in a cosy mouthpiece ring. The bong is intended for both herb and oil lovers as it comes with an oil adaptor, a nail and a dome.